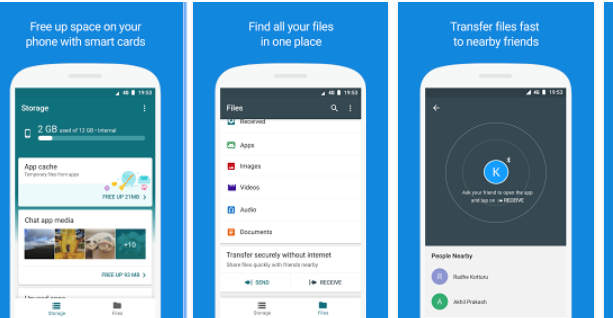 Google has recently released a new application called Files Go which is similar in its concept to Apple’s AirDrop with the exception that Files Go works on Android devices. The app allows you to better manage your files and helps you free up space on your phone. Files Go is still in beta version and is available for free download in Goole Play App Store. Some of the features provided by Files Go include: Recommends rarely-used apps to remove so your phone stays speedy; recognizes and helps you get rid of spam & duplicate images; helps you find your important photos, videos, and documents faster; makes it easy to share your files offline -- quickly and securely; files Go Beta is light on space -- under 6MB.’ To learn more about how to download and use Files Go, check out this guide from Lifehacker.